"Pick Up the Mantle," Kathryn Matthews, Sermon Seeds, UCC, 2016. "Outright Rejection and Hesitant Responses," D Mark Davis, Left Behind and Loving It, 2013. We Ain't Gon' Let Nobody Turn Us Around , John Jewell, Lectionary Tales, 2013. Bold Requests and Challenges, Bruce Epperly, Living a Holy Adventure, 2013. Evangelectionary for Sunday, June 30, 2013. R. Wayne Calhoun, Evangelism Connections. The Lectionary Lab, Pentecost +6, the Rev'ds Dr. John Fairless and Delmer Chilton (aka "Two Bubbas and a Bible"), 2013. Lectionary Lab Live podcast. Girardian Reflections on the Lectionary, Proper 8, by Paul Nuechterlein & Friends. Jesus Now, Proper (Ordinary) 13C. Lectionary, study and worship resources from Faith Futures Jesus Then & Now. "Every Moment Counts," Karoline Lewis, Dear Working Preacher, 2016. "Christian Freedom," John W. Martens, America: The National Catholic Reporter, 2016. "Blessed Are the Fanatics," Glenn Monson, Law & Gospel Everywhere, 2016. The Preacher's Study, John W.B. Hill, The Associated Parihes for Liturgy and Mission, 2016. "Fire and the Fruits," Eric Smith, LECTIO, 2016. "Plowing a Field of Terror and Hate," Nancy Rockwell, The Bite in the Apple, 2016. "Setting Our Faith Towards Paradox," Andrew Prior, 2016. "Freed to be Free - Really Free," Sharron R. Blezard, Stewardship of Life, 2016. "Enjoying our Freedom?" Steve Godfrey, Church in the World, 2016. "In the Day of Trouble," Melissa Bane Sevier, Contemplative Viewfinder, 2016. "Don't Look Back!" Bob Cornwell, Ponderings on a Faith Journey, 2016. "Living a 'Double Portion' Life," Anna Shirey, The Labyrinth Way, 2016. "Letting the Dead Bury their Own Dead," Janet H Hunt, Dancing with the Word, 2016. "Chariots of Fire," Jerry Carpenter, Weimar Wanderings, 2016. Sacredise Worship Resources, John vandeLaar, 2016. "Hand to the Plow," Suzanne Guthrie, At the Edge of the Enclosure. To Go To Jerusalem, Andrew King, A Poetic Kind of Place, 2016. "In the Wake of Orlando, June 12, 2016," Scott Barton, Lectionary Poetry, 2016. Choose Your Path, Thomas Beam, 2016. "Out of Control," David Lose, Dear Working Preacher, 2013. "Stay Close," Ragan Sutterfield, Ekklesia Project, 2013. "Resistance is Futile," Rev. Dr. Karyn L. Wiseman, Odyssey Networks, 2013. "Of Masters and Pupils," John C. Holbert, Opening the Old Testament, 2013. "Keep Your Hnad on the Plow!" Alyce M. McKenzie, Edgy Exegesis, 2013. "The Politics of Elijah: Struggling with Elijah's Legacy," Amy Merritt Willis, Political Theology, 2013. "Mentors," Beth Scibienski, A Thousand Years of Inspiration, 2013. "Face Palm," Rick Morley, 2013. Now!, Sharron R. Blezard, Stewardship of Life, 2013. 2010. "Hand to the Plough," Peter Lockhart, a different heresy, 2013. "No Turning Back," Janet Hunt, Dancing with the Word, 2013. "Hand to the Plow," Suzanne Guthrie, Soulwork toward Sunday: At the Edge of the Enclosure, 2013. "Home Free," Anne Howard, The Beatitudes Society, 2013. Raining Fire, Thomas Beam, 2013. "Plough On," Christopher Burkett, PreacherRhetorica, 2013. "Something WILL Grow There," Steve Goodier, Life Support System, 2013. "Jesus Is Getting a Good Deal," Larry Patten, 2013. How Not to be a Disciple; A Summer Sermon Series. Ideas from Alyce McKenzie about a summer series on the Luke texts, Patheos, 2010. A Double Share of the Spirit: Reflections on the Lectionary, Bruce Epperly, Faith Forward, Patheos, 2010. Flag vs Font: Pledging Our Allegiance, Debra Dean Murphy, Intersections, 2010. "More Than Elijah," Andrew Prior, A Church (re)Wired, 2010. Pentecost 5, Laura and Matt Norvell, Grounded & Rooted in Love, 2010. Live, Love, Learn, Leave a Legacy, Heidi Jakoby, by the way, 2010. Thoughts and Exegesis, Proper 8C, RMC Morley, a garden path, 2010. A Spurious Verse with an Authentic Voice: My Favorite Text that Shouldn't be in the Bible, The Journey with Jesus: Notes to Myself, Daniel B. Clendenin, Journey with Jesus Foundation, 2010. "I Cry Aloud to God," Melissa Bane Sevier, Contemplative Viewfinder, 2010. Keep Your Hand to the Plow -- No Matter How Crooked the Furrow, Pastor Sharron R. Lucas, Stewardship of Life Institute, 2010. Daily Reflection, Ordinary 13, Larry Gillick, S.J., Creighton University, 2010. Dylan's Lectionary Blog, Proper 8C. Biblical Scholar Sarah Dylan Breuer looks at readings for the coming Sunday in the lectionary of the Episcopal Church. Proper 8C - preached at St Mungo's Alexandreia after the EU Referendum, Dr. Charlotte Methuen, 2016. "The Mantle Is Passed" by Joanna Adams. A Sermon for Every Sunday. Video sermons from America's best preachers for every Sunday of the Liturgical Year. "Urgency and Focus," Tony Sundermeier, Day 1, 2016. "The Cranky Jesus," the Right Rev. Stacy Sauls (TEC), Day 1, 2013. "Getting past the distractions," the Rev. Nils Chittenden, Sermons that Work, Episcopal Digital Network, 2013. 6 Pentecostés, Propio 8 (C) – 2013 POR EL RVDO. PABLO VELÁZQUEZ ABREU, Sermones que Iluminan. "Free to love," Faith Element, 2016. Podcast. "Pick Up the Mantle," Weekly Seeds, UCC, 2016. Bible Study, Proper 6C 2013, Christine Hord, Virginia Theological Seminary, Sermons that Work, Episcopal Digital Network. Estudio de la Biblia. 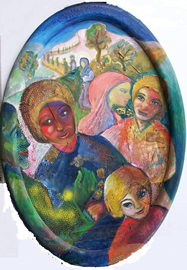 6 Pentecostés, Propio 8 (C) por Christine Hord, Sermones que Iluminan, 2013. Mustard Seeds, "Freedom, Discipleship, Memory," Proper 8 / Ordinary 13 / Pentecost 6, 2013. A lectionary-based ideas resource for leaders of contemporary worship, Ann Scull, Gippsland, Australia. LCA Worship Planning Page, Pentecost +6, "Everything lay-readers need to prepare worship." Worship Resources, Sixth After Pentecost, Rev. Mindi, Rev-o-lution, 2016. Worship and Liturgy Resources, Pentecost 4, by Rev David Beswick, Uniting Church in Australia. Lectionary Liturgies, Proper 8, Thom M. Shuman, Presbyterian Church (U.S.A.). Lector's Notes, Ordinary 13, Gregory Warnusz, Saint Jerome Parish, Bellefontaine Neighbors, MO. Notes and commentary for those reading this week's lectionary texts to the congregation. "Putting on the Mantle," rtf or pdf file of liturgy at Worship Ways. A Prayer for the Sixth Sunday after Pentecost, Stephen Brown, Prayers from the Closet, 2013. The Timeless Psalms: Psalm 77, Joan Stott, prayers and meditations based on lectionary Psalms, 2016. Prayer for Proper 8C, RevGalBlogPals, 2013. HermanoLeón Clipart, Ordinary 13. Free clipart, backgrounds, slides, etc. Clip Art, Ordinary 13C, Fr. Richard Lonsdale, Resources for Catholic Educators. Clip Art Images: Luke 9:51-62, Luke 9:51-62 #2, Misioneros Del Sagrado Corazón en el Perú. "Fruit Shaped Ice Cubes," video, John Stevens, Dollar Store Children's Sermons, 2013. "I Cry Aloud," Brenton Prigge, NewHymn. Hymns of the Spirit Three, Proper 8C, Richard E. Hurst, Universalist National Memorial Church. Psalm 77:1-2, 11-20 set to Hendon (77 77 7), Psalm 16 set to Finlandia (11 10 11 10 11 10), by Dale A. Schoening, Metrical Psalms. Hymn and Song Suggestions, Proper 8C, 2016, annotated suggestions from Natalie Sims, Singing from the Lectionary. The Billabong, Sunday 13, by Rev Jeff Shrowder, Uniting Church in Australia: Hymn suggestions and paraphrases of lectionary Psalms. Worship Resource Manual, The Moravian Church, Southern Province. Worksheets for planning music in worship: hymns, anthems, solos, organ repertoire suggestions for RCL texts. Direct link to Proper 8. Choral Anthem Project, Ordinary 13C, National Association of Pastoral Musicians. Sing for Joy, Lectionary 13, 2007. Choral reflections on this week's lectionary readings, St. Olaf College. "Facing Forward," On the Chancel Steps, children's resources by Frances Woodruff, 2013. Story for Children's Worship and Family Activity, Ordinary 13, at word-sunday.com: A Catholic Resource for the Lectionary by Larry Broding. "When the Going Gets Rough," Children's Sermon from Sermons4kids.com. Lectionary Puzzles, Proper 8/Ordinary 13. Word search puzzles in RTF or plain text, by Reg McMillan, St.Stephen's Presbyterian Church, Peterborough, Ontario.